Hungarian Egg Twist bread is perfect for every day or a special occasion. You can sprinkle nuts or other additions into this sweetened bread or eat it as is. John’s parents came over for Easter dinner. I don’t know anyone who enjoys baked bread as much as my mother-in-law so I always enjoy having some freshly baked bread when we have them over. I knew she would love this Hungarian Egg Twist Bread. My bread recipe submission was also due with #BreadBakers. The theme this month was Easter, Passover and Springtime Bread from Around the World, which was perfect timing for my Easter dinner. One thing that I learned is that there are often variations of the same bread in other countries. The Hungarian egg twist is also referred to as fonott kalacs. 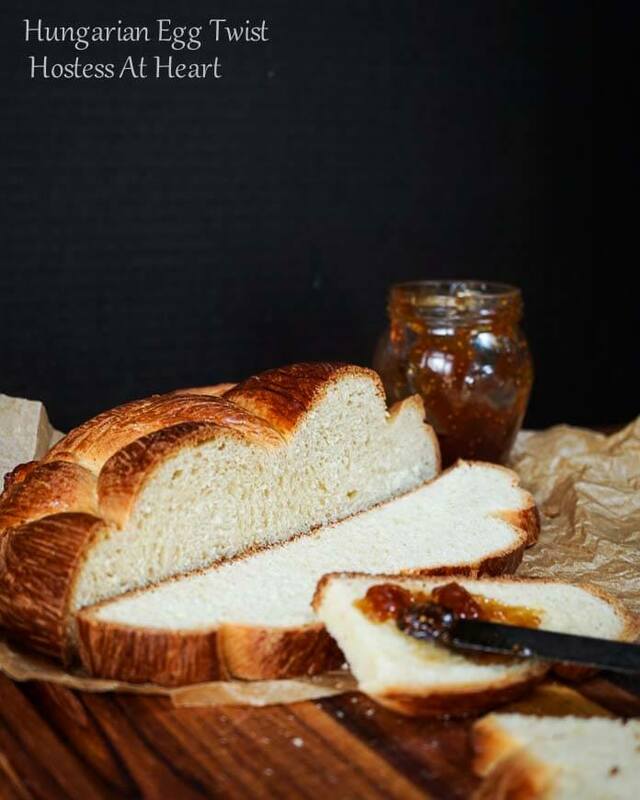 Kalacs (kaw-lahch) refer to any yeast-raised cake or sweet bread. They are braided and can be in a loaf or in a circle. They can also be sprinkled with walnuts or fruits. John loves freshly baked bread too but doesn’t like raisins or nuts in baked goods, so I made my bread without either. I do baby that boy. This bread is slightly sweet and has a hint of fresh lemon. It’s also delicious and makes great toast with jam. The instructions said to bake this bread for 50 minutes or 190 degrees F. I checked my bread at 40 minutes and it was already at 206 degrees F. Next time I will check my bread at 30 minutes. I enjoyed making this bread and will make it again. 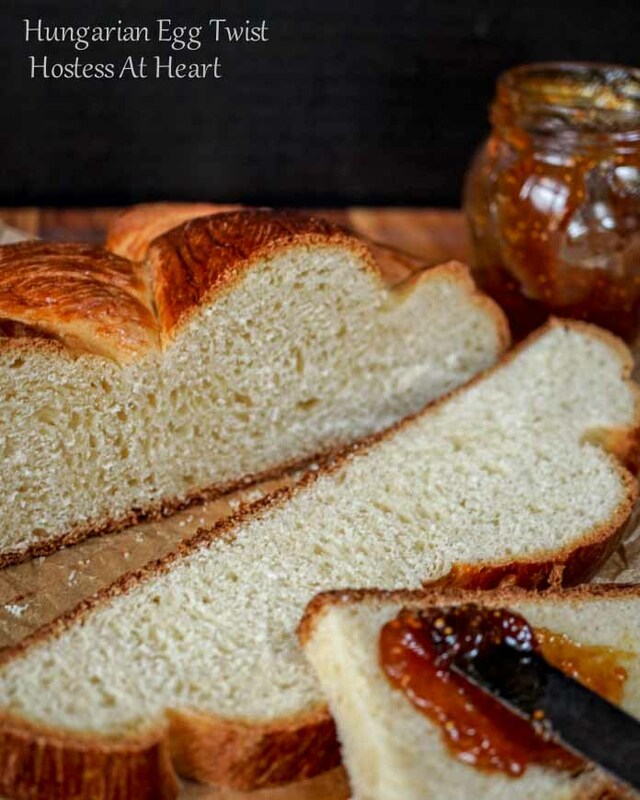 Hungarian Egg Twist bread is perfect for everyday or dressed up for a special occasion. You can sprinkle in nuts and dried fruit or other additions to this sweetened bread or eat it as is. Stir 1 teaspoon of sugar and yeast into cooled scalded milk and let sit for 5 minutes or until activated. In the bowl of a stand-up mixer, fitted with a dough hook, combine flour, salt, butter, sugar, 2 eggs, zest, and raisins. Mix until dough is smooth and elastic. Place the dough in a well-oiled bowl, turning the dough once to coat both sides. Cover with greased plastic wrap and allow to rise until doubled in a warm place (1 to 1-1/2 hours). When risen, punch down dough and turn out onto a lightly floured surface. Cut into three equal sized pieces and allow to rest covered about 5 minutes. Roll each piece of dough into a 20-inch rope. Braid the three pieces into one long twist or join ends into a circle. Place on a parchment-lined baking sheet, tucking ends under. Cover with greased plastic wrap and allow to rise until doubled (1 hour). Preheat oven to 375 degrees F. Combine the egg yolk and the milk together. Brush over entire surface of the braid. Bake for 30 to 40 minutes or until an instant-read thermometer registers 190 degrees F. Tent with foil if crust browns too quickly. Let rest at least 20 minutes before slicing. Here are the other beautiful breads from this month’s Bread Bakers group! What is Bread Bakers? It’s a group of bread loving bakers who get together once a month to bake bread with a common ingredient or theme. You can see all our of lovely bread by following our Bread Bakers Pinterest Board. Links are updated after each event on the Bread Bakers home page. Here are a few of my other favorite bread recipes for Bread Bakers! Thank you so much! I love baking bread. Thank you Angie! I hope you have an FFF! Fantastic Fiesta Friday!!! This is one BEAUTIFUL bread! I love baking bread too and i definitely need to try this! It looks absolutely gorgeous! Thank you Dini! To me, there is something magical about baking bread. It is so rewarding. This is a gorgeous loaf! Looks delicious! Thank you! I just love it when they come from the oven and your kitchen smells so good. Thank you Lili! I do love to experiment. I so so much inspiration with our blogging community! Looks lovely and I like the idea of the slightly lemon flavor in there. And a great idea having baking challenges too! Thank you Caroline. I liked the bit of lemon too. It upped the bit of sweetness I think. Wow, this bread looks insanely good! The texture on that cut load, I want to dive onto it and use it as a pillow! Ha! I am having fun in my kitchen now days. I love it when something turns out, but as you know, that isn’t always the case. Haha yes, all the failures are worth it when you make something that looks like this! Thank you Trisha! I grew up baking and love it . I also see some of the beautiful things people make and am amazed! What a beautiful bread and lovely golden crust! I (tried) to make a braided bread the other day and it was an utter disaster (then again I even find braiding hair difficult! )–so I really appreciate how perfect this braiding looks! This looks absolutely stunning, Julie! Your photographs made me almost weep … Thank you so much for bringing this glorious bread along to this week’s Fiesta Friday party! Your bread club sounds intriguing … I might have to check it out! Thank you Ginger! It is a very laid back friendly group and only one assignment a month makes it easy. It also makes sure that my hubby gets homemade bread at least once a month. Awesome braid bread twist so soft and looks beautiful…………………. Thank you so much! It had a nice crumb that was great to eat but I loved that it was also strong enough to hold up as French toast. I am a sucker for all braided breads. Love this! I apologize for not responding earlier. I found this note in spam. I loved making this bread and will try other braids in the future! Thank you! I do love that stuff but am being pretty careful. Especially since I’m not as active right now. That’s good – I found I have been making way too much bread and eating it – not good for my waistline! That is a beautiful bread. Love that deep golden crust on top — so yummy!! Your bread looks amazing, Julie! Just perfect. I bet your mother-in-law and husband loved it. I had never heard of this bread so it was fun to learn about it. Thanks for sharing the recipe! Thank you Shari! It was indeed a hit. I LOVE that you and Renee, from Magnolia days, both took trips to Hungary. I have never made bread from there…I will now! Thanks for joining the #BreadBakers fun. Thank you! It was so much fun and I look forward to next month. Thanks Loretta! I agree that there are some amazing entries with this group. I’m having fun and unlike some things that I make I never have to give bread away. 🙂 Have a great day! Beautiful bread! I’m with John on the nuts (feh, who needs ’em?) but I’ll be adding the raisins back in when I make this—which I will soon because it’s definitely calling my name. Thanks for sharing it! Thank you Robin! I agree with you on the nuts but I do love the raisins. 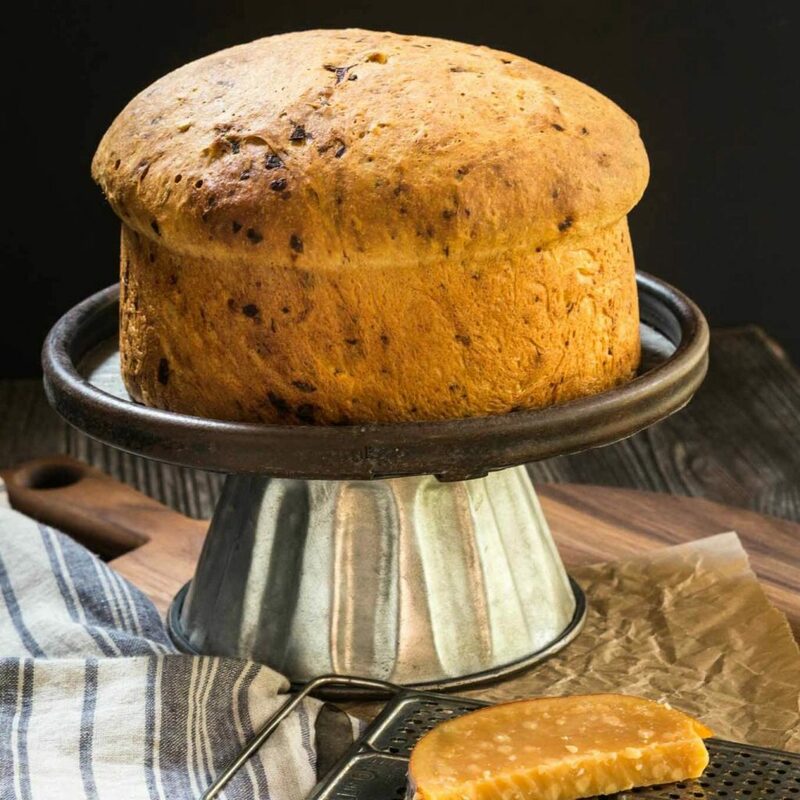 This bread is absolutely amazing Julie and the color is just gorgeous! Thank you Linda! I was very happy with the way it came out. Thank you! I would gladly share with you Aisha and put on the coffee! Thank you Mireille! That is pretty much how we finished it off. I love how springy that bread looks! Yum! Wow what a scrumptious looking bread dear Julie…..
That bread, and those photos are just beautiful. It is funny how different versions of the same bread exist. Thank you Karen! I love seeing how everyone interprets them too. That goes back to my belief that recipes are often more about the story. I see by your title that you agree too! A beautiful loaf! There is something so therapeutic about bread baking. That is one gorgeous loaf of bread. I hope your husband appreciates your good care of him. Spectacular bread. And sometimes it’s good to baby someone! Thank you Sarah! The bread did come out pretty! I enjoyed unveiling it at Easter dinner. Thank you Jenni! I thought about making French toast too but I didn’t have enough left over. Next time. Lovely loaf, Julie! I’d love a slice of that slathered in butter and jam! Thank you Stacy! It made excellent toast. Thank you Stacy! This was a fun bread for me to make. What an utterly gorgeous bread Julie!! It looks perfect! Thank you! I am with you but couldn’t eat the whole thing so made sure I’d have help. Coffee’s on Stephy! Help yourself. We both took a virtual trip to Hungary for this event. I like your sweet bread and will put it on my to-bake list. Thank you Renee! I’m on my way to your side of Hungary. This was a fun project! I’m headed over to see your experience with Hungary. Thanks for stopping by.